100 Door Codes Level 20 Walkthrough is shown below with screenshots. The point of this game is to figure out the door code/password to get to open the door. Look around the room for clues on what the numbers are. They can vary from 4 numbers to 6 numbers. When you think you have the code, press the circular keypad and enter the numbers. If you enter the incorrect numbers, there will be a buzz sound effect. Press the back button, analyze the level again, and press the keypad when you think you have the answer. The answer for this level is explained in detail in the text below. Look at the screenshots for more help. If you only want to look at part of the guide and not cheat, just look at part of the solution. This will help you go to 100 Door Codes Level 21. 1. 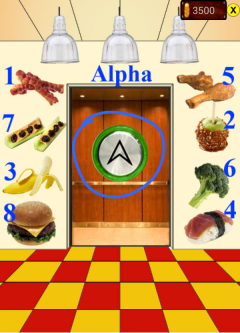 The clue for this level is the picture of meat on the door. Find the pictures of meat to the left and right of the door and remember the number for it. The order of the door code is the meats in alphabetical order. Press the keypad and enter 8541. 2. Proceed to the next 100 Door Codes level!